Timetable, Scotrail, "Scotrail Engineering Operations", date made 1988, train service alterations at weekends in February 1988 Glasgow, Edinburgh, Polmont junction, Whinchburgh junction, number of pages 84. Timetable, Scotrail, "Your Highland Rail Guide", date made 1987, double fold leaflet, timetable Inverness-Edinburgh, Glasgow-Thurso-Wick, Kyle of Lochalsh-Aberdeen, with general information, cover illustration front of Deltic. Poster, British Railways, Scot-Rail, Escape Routes, Pitlochry, 1996. Coloured lithograph featuring an illustration depicting the view over the town, with houses and hotels, and hills beyond. Accompanying text reads "Things move slowly here. There the similarity with the M8 ends". Yellow border. 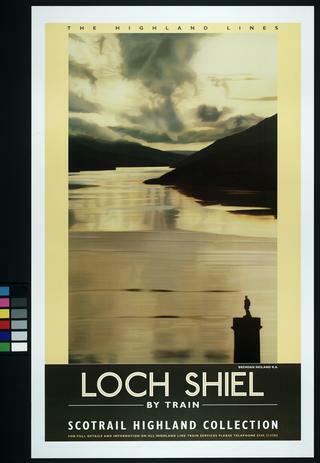 Poster, British Railways, Scot-Rail, Escape Routes, Corrour, 1996. Coloured lithograph featuring an illustration depicting Loch Ossian near Corrour station, with trees on the shore and mountains on either side. Accompanying text reads "You can't sail there, you can't fly there, you can't drive there". Yellow border. Poster, ScotRail, "From March 24th Bathgate to Edinburgh just 30 minutes", circa 1985, picture of front of train bursting through paper covering, text "We're getting there, ScotRail. Poster, ScotRail, "National Championship", 1988, advertising athletics meeting, Picture of athletes running with background of Scottish flag, text "Organised under S. A. A. A. and S. W. A. A. A. rules, Crownpoint Sports Centre, Glasgow, 22/23 July 1988, Doors open at 17.00 Friday and 11.00 Saturday, Admission Friday 50p Saturday £1.00 Half price for o.a.p's, and children, Scottish Amateur Athletic Association / Scottish Women's Amateur Athletic Association, for information phone 014-554 8274. Leaflet, Scotrail, "Sprinter Service Time Table Edinburgh to Dundee", date made 1987, split fold leaflet, cover illustration photo of Sprinter coach. Leaflet, Scotrail, "Scotrail's Super Sprinter The Next Stage", 1987, advance information on latest fleet improvements, single fold leaflet, cover illustration drawing of head and side view of Sprinter carriage. Leaflet, Scotrail, "The Gleneagles Link", date made 1988, advertising leaflet for excursions to the Scottish Open, cover illustration photo of Ian Woosnan holding the trophy. Menu, card, Menu, issued by ScotRail for onboard catering services, 2013. Advertises sandwiches, crisps, drinks, sweets etc. available for purchase; all items are illustrated. Back cover bears the message 'We're calling time on drinking alcohol after 9pm'. Has a large number 9 with alcoholic drinks portrayed in the centre with a 'forbidden' bar through them. Note that alcoholic drinks are listed in the menu. Booklet, Tay Bridge 1887, published by Scotrail 1987, (E5A/148P). Leaflet, Scotrail, "Scotrail's Sprinter", date made 1987, advertising introduction of Sprinter from 4 October 1987, single fold leaflet, cover illustration drawing of head and side of Sprinter coach. Poster, British Railways, Scot-Rail, Escape Routes, Stirling Castle, 1996. Coloured lithograph featuring an illustration depicting a view looking up at the battlements of Stirling Castle, beneath a red sky. There are mountains in the distance. Accompanying text reads "People still flee there to escape the marauding hordes". Yellow border. Poster, British Railways, Scot-Rail, Escape Routes, Newhaven, Edinburgh, 1996. Coloured lithograph featuring an illustration depicting Newhaven, near Edinburgh, Scotland, on the west side of Leith Harbour. It shows small boats moored in the harbour, surrounded by swans, with the harbour walls and a lighthouse in the background. Beyond is the town, with the Forth Bridge just visible in the distance. Additional text reads "There's no giftshop and you can't buy a t-shirt". Yellow border. 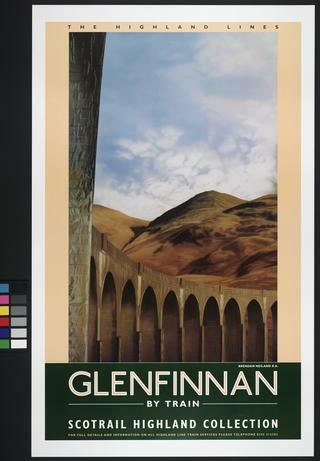 Poster, Scotrail, The Highland lines- Tain by Train by Brendan Neiland R.A., 1996. Format: double royal. Dimensions: 40 x 25 inches, 1016 x 635mm. Press release issued by Scotrail to news editors, 'North Berwick Line Marks 150 Years', describing the train naming ceremony and Scotrail's plans for the future of this route. Issued 17 June 2000. Leaflet, Scotrail, "In Town Twonight and London", date made 1987, advertising leaflet for two night London breaks from various areas of Scotland. 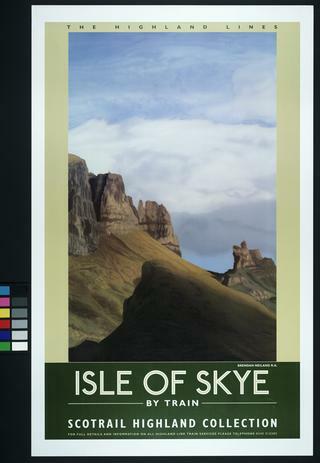 Poster, ScotRail, "Scene 93", 1993, three views, cityscape, loch and moors, train on a viaduct through mountains, reproduction of front cover of Scene 93, Text "The Beaten Track, The Unbeaten track, Unbeaten for Unbeatable days out by rail in Scotland pick up a copy of Scene 93 at a ScotRail station or phone 081.2000200. Brochure, paper, ScotRail. Investing for the future, produced by ScotRail, 2009. Describes ScotRail's investments and future plans (ScotRail operated as part of the First group). 16pp with illustrations, map. Leaflet, Scotrail, "Rail Rovers Central 1st April 1987 - 31st March 1988", date made 1987, information about and order form for Rail Rover tickets, illustrated with photos of places of interest, two fold leaflet, cover illustration photo of hotel in the Highlands. Poster, BRB Intercity (Scotrail) Designed by Nature....Built on Beautiful Lines depicting a Diesel Multiple Unit in snow. Format: double royal. Dimensions: 40 x 25 inches, 1016 x 635mm. 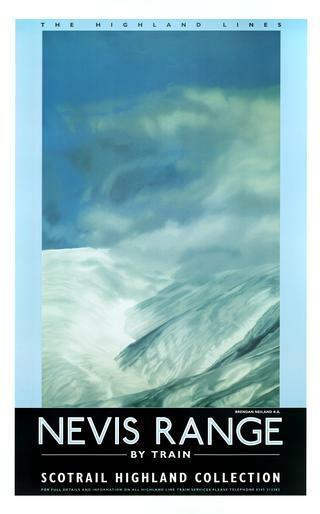 Poster, ScotRail, The Highland Lines - Glen Coe By Train, Brendan Neiland R.A., Shows hills shrouded in mist.1996. Format: double royal. Dimensions: 40 x 25 inches, 1016 x 635mm. Leaflet, Scotrail, "Rail Rovers West Highland 1st April 1987 - 31st March 1988", date made 1987, information on booking and form for Rail Rovers illustrated with photos of places of interest, double fold leaflet, cover illustration Scottish country house from garden. Timetable, Scotrail, "Scotrail Sprinters", date made 1987, single fold leaflet, timetable Edinburgh to Bathgate until 15 May 1988, cover illustration head and side of front of Sprinter coach. Poster, Joint Scotrail/Scottish Tourist Board poster, (Scotland's for Me! 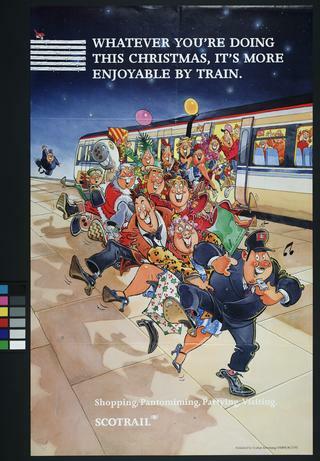 Get Me There by Train), Advertising Scottish Railways holidays advertised in the Scottish Tourist Board Brochure - "Holiday Scotland '86", 1986. Leaflet, West Highland Line 1894-1994, issued by Scotrail, 1980s. Contains an appreciation of the West Highland Line by Scottish folk singer Jimmie Macgregor. A4, 4pp.